The latest edition of Morning Consult’s Governor Approval Rankings reveals that the top ten most popular governors in America are Republicans, a statistic that remains unchanged for five consecutive quarters. The ranking was compiled from online surveys conducted among nearly 275,000 registered voters between January and March of this year. The top four governors remained unchanged from the fourth quarter of 2017. The governors who received at least 65 percent support from their constituents are Charlie Baker of Massachusetts, Larry Hogan of Maryland, Kay Ivey of Alabama, and Phil Scott of Vermont. Among the 33 governors who are Republicans, the least popular is Oklahoma’s Mary Fallin, with a 19 percent approval rating. Among Democrats, Connecticut Gov. Dan Malloy is the least popular governor in the country, with a 72 percent disapproval rating. Hawaii Gov. David Ige joined the bottom ten after falling 20 points from his ranking in the fourth quarter of 2017. Illinois Gov. Rauner dropped 10 percentage points in the first three months of 2018, and now holds the third worst approval ranking. Morning Consult notes that three in five Illinois voters disapprove of Rauner’s job performance as he attempts to hold off Democratic candidate J.B. Pritzker, a billionaire philanthropist and venture capitalist, in November. Like Hawaii and Illinois, Louisiana Democratic Gov. John Bel Edwards also fared worse. His drop was six points, from 56 to 49 percent within six months, but he went from being the most popular Democratic governor in January to barely holding a 50 percent approval rating six months later. At 49 percent, it’s Edwards’ lowest approval rating to date. His disapproval rating held at 35 percent; and 16 percent said they didn’t know or didn’t care. Critics note that the Morning Consult doesn’t measure electability in its quarterly surveys. Factoring in its ranking with recent polls suggests that Edwards faces an uphill re-election battle in 2019. In March, a Mason-Dixon poll showed Edwards receiving 46 percent of the vote against Republican Congressman Steve Scalise, 45 percent against Sen. John Kennedy, 51 percent against Rep. Ralph Abraham. In late June, a SurveyUSA poll paid for by Republican Sen. John Kennedy and published in June, showed Kennedy beating Edwards by a vote of 51 to 37, and an unknown Republican candidate beating him by 51 to 35. No Louisiana governor has left office with a positive approval rating since Edwin Edwards in 1979, and no Democratic governor has won re-election since Edwards’ win in 1975. Morning Consult’s top ten most popular governors are Charlie Baker (R-Mass., 71 percent approval), Larry Hogan (R-Md., 68 percent), Kay Ivey (R-Ala., 67 percent), Phil Scott (R-Vt., 65 percent), Chris Sununu (R-NH, 63 percent), Dennis Daugaard (R-SD, 62 percent), Matt Mead (R-Wyo., 61 percent), Gary Herbert (R-Utah, 60 percent), Doug Burgum (R-ND, 58 percent), Brian Sandoval (R-Nev., 57 percent). The 10 least popular governors are Dan Malloy (D-Conn., 72 percent disapproval rating), Mary Fallin (R-Okla., 63 percent), Bruce Rauner (R-Ill., 60 percent), Susana Martinez (R-NM, 53 percent), Paul LePage (R-Maine, 53 percent), Bill Walker (I-Ark., 52 percent), Gina Raimondo (D-RI, 50 percent), Scott Walker (R-Wis., 50 percent), David Ige (D-HI, 49 percent), Rick Snyder (R-MI, 47 percent). Among governors running for re-election in 2018, those with net disapproval ratings are Wisconsin’s Walker (-7 percent), Illinois’ Rauner (-34 percent), Rhode Island’s Raimondo (-11 percent), Arkansas’ Walker (-23 percent), and Hawaii’s Ige (-12 percent). 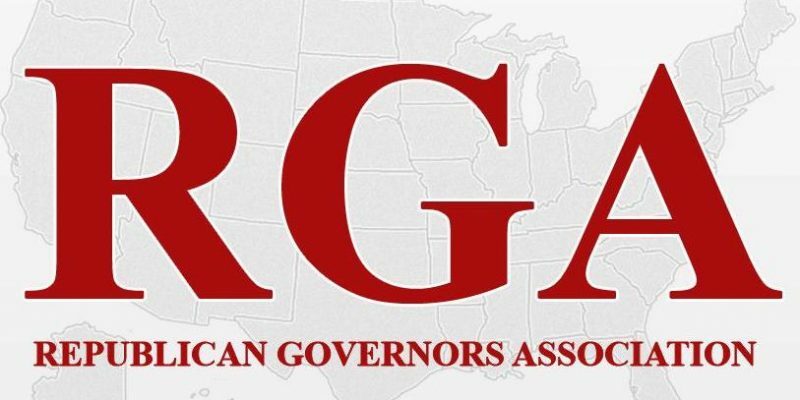 In an effort to keep the majority of governors’ seats Republican, the Republican Governors Association (RGA) announced it has a record-breaking amount of cash on hand with $87.5 million in the bank, the most in the RGA’s history. Its reserve is estimated to be nearly five times that held by the Democratic Governors Association of roughly $18 million. The RGA raised $26.6 million in the second quarter of 2018, bringing its total fundraising amount to $113 million for the 2018 cycle.